Syria Airstrikes: Is All-Out War a Distinct Possibility Now? 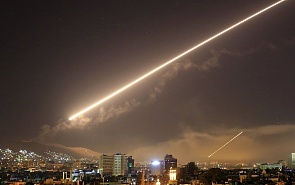 In the early hours of Saturday, the United States, supported by the United Kingdom and France, launched airstrikes on a number of targets in Syria in response to alleged use of chemical weapons by the Syrian government forces in Damascus’ suburb of Douma. The attacks were personally announced by US President Donald Trump. “The US President is trying to easily score political points by carrying out an operation which is known to lead to no consequences or problems for him,” Andrey Sushentsov, Programme Director of the Valdai Club, told valdaiclub.com. “What Russia needs is to keep restraint and to accomplish what it began – up to the complete victory of the government forces in Syria,” he said. The strikes are clearly a challenge to Moscow, Sushentsov believes. According to him, it is most probably a “one-off attack,” which is unlikely to have continuation. But it is crucial for Moscow “not to overreact,” he pointed out. “The western states tend to buy into such provocations. Russia must be prepared to this and provide a better media coverage of each particular incident, by giving the real picture,” Sushentsov said. Neither Russia nor the US want a deliberate war with each other over Syria, Valdai Club expert Richard Weitz, Director of the Hudson Institute’ s Center for Political-Military Analysis, believes. “The US/NATO military planners took care to avoid striking Russian targets, and limited the strike in other ways, while the Russian forces prudently avoided directly attacking the intervening forces as well,” he told valdaiclub.com in his comments sent Saturday by email. “Even if the Western governments attacked the Syrian government again following a perceived chemical weapons attack, and Russian and Western forces came into some kind of direct exchange of fire in Syria, I still think the fighting would remain limited to Syria, and would not spread to other countries,” he added. “An accidental war would more likely occur through some kind of cyber or other incident for which there has been less planning than Syria, where Russian and US planners have developed good deconfliction procedures and other safeguards,” Richard Weitz said. The claims that the Syrian government had used chemical weapons against civilians in Douma were made last week by several groups of Syrian opposition activists and were never confirmed by any independent body. Russian President Vladimir Putin said in a statement Saturday that the strikes of the US-led coalition had been carried out in violation of norms and principles of the international law and posed a breach of sovereignty of an independent state. The Organization for the Prohibition of Chemical Weapons (OPCW) sent its experts to Syria to launch probe into the alleged attack, but the group of Western countries "cynically disregarded it" and undertook military action even before the investigation was completed, the Russian president said.